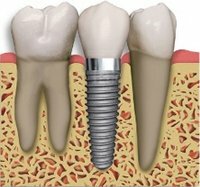 Think of dental implants as metal anchors, usually made of titanium, that are surgically placed into the jawbone to hold permanent teeth replacements or dentures. Through a process called "osseointegration", the jawbone naturally attaches itself to the implant over time, creating tremendous stability. Improved biting pressure – a dental implants treatment can often restore bite pressure to a level similar to healthy natural teeth. Longevity and reliability - with proper oral hygiene and care, dental implants have been shown to last as long as 20 years or more with few complications. Increased self-confidence - dental implants function remarkably like natural teeth. Most people who choose a dental implants treatment find that they can again laugh, chew, talk, and smile with renewed confidence. and our All-On-4 Dental Implants page. It has long been the goal of dentistry to develop a reliable system of replacement teeth based on an artificial tooth root or implant. The ability to insert a substance into the human jaw bone and have a reasonable expectation of a successful outcome has become reality with the use of “osseointegrated” implants as pioneered by Professor P.I.Branemark in Sweden over 30 years ago. The key to these implants may be the use of nearly pure titanium (which is extremely compatible with bone), their shape, and the specialised techniques for their placement. Dr Branemark's original research cases worked with people with no teeth at all, and still the success rates have been very high. In general, for this type of treatment we expect 98% of dental implants to continue to be healthy and functional after 15 years. If you are interested in dental implants in Melbourne, please book a consultation with our dental implants dentist Dr Nataniel Goldstein please do not hesitate to contact Us on (03) 9500 2084 . We are here to help you. Basic implants as a whole usually consist of 2 elements. Firstly, a titanium screw which is placed into the jaw bone to provide a solid foundation. The titanium surface is specially treated to promote the healing of your bone onto it, much like the titanium used in replacing hip and knee joints. Secondly, there is the “crown” that is screwed into the implant. This is the part that you can see above the gum line. Currently, the materials available to construct crowns are better than ever, and can be seamlessly matched to blend in with your natural teeth. Although everyone is different in their sensations of discomfort, most people find the placement of an implant to be a similar sensation to having a relatively simple extraction. However, there is a spectrum of discomfort depending on the complexity of the surgery. For example, the need for simultaneous bone and soft tissue grafting at the time of implant placement would create more discomfort than a simple single implant placement. All our patients are given strong analgesics after surgery to ensure that your recovery period is as comfortable as possible. How long do I have to wait after the implant(s) are placed before I will have my new tooth/teeth? This really depends on a number of factors, including the quality of the bone at the site of placement, whether or not bone and soft tissue grafting are also required, and the degree of torque that can be placed on the implant during surgery. As a guideline it is anywhere from 24 hours to 6 months. My dentures are loose, can dental implants help? Absolutely. There are several ways dental implants can help people who are fed up with their dentures. For example, 2 lower implants can simply be placed in the lower jaw to anchor a lower complete denture in place so it won't move around whilst you eat. Or you can even throw your denture away and have more implants placed to support a fixed bridge. Just 4 implants in the lower jaw and 6 in the upper can be enough to support 24 teeth! Ask Dr Nataniel Goldstein about all of your options. 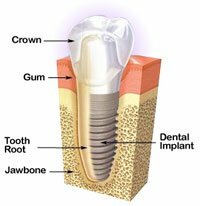 What is involved before I have my dental implant placed? 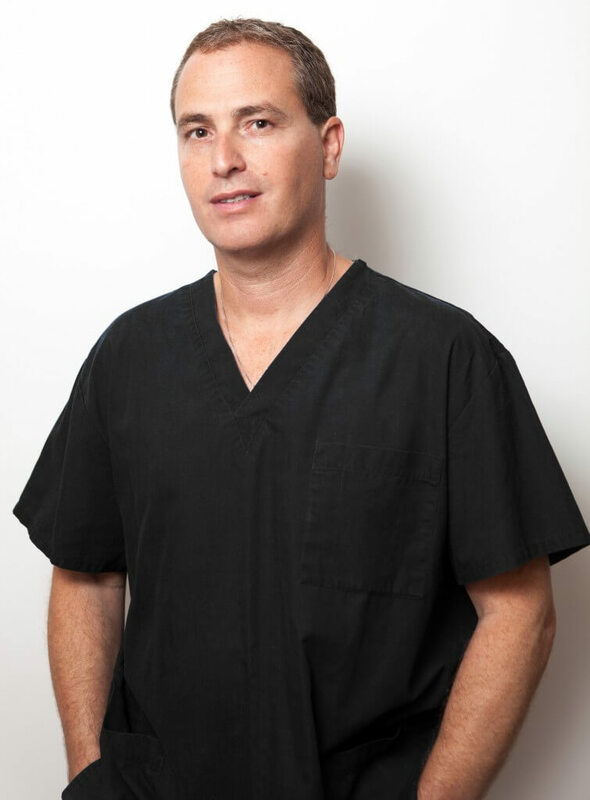 First you will meet with Dr Nataniel Goldstein for a consultation during which your medical history is reviewed and a thorough examination of the potential implant site is completed. At the end of the consultation you will likely need to undergo a Cone Beam CT with a nearby radiographer. Once Dr Nataniel Goldstein has seen the scans, you will then be sent a treatment plan detailing the costs and further information relevant to your case. The next appointment would usually be for the surgery. I'm nervous about treatment, what can you do to help? Don't worry, at the Cosmetic and Laser Dentistry Centre we understand your anxiety and our whole team is well equipped to make your experience as pleasant and smooth as possible. During your consultation with Dr Nataniel Goldstein you can discuss the different options and techniques that are available to address any concerns. Solutions for anxiety can range from taking a sedative tablet 1 hour before surgery to help you feel more relaxed, to being administered anaesthetic so that you are asleep during the procedure. Should I consider “dental tourism” as an option? Cosmetic & Laser Dentistry Centre specialises in cosmetic dentistry, porcelain veneers, porcelain crowns, Invisalign, , dental implants, composite bonding, composite veneers, resin veneers,, All on 4 permadent, fillers – TMJ, grinding, dentofacial aesthetics,, natural teeth whitening,teeth whitening, aesthetic dentist, Glamsmile veneers, receding gums, pinhole, gum graft, laser dentist, no needle, no drill dentist, and sleep dentistry.